All of us have unwanted scars that we have for life but many of us don’t know we can treat the look of our scars. Cosmeticare’s Medspa offers various laser treatments that I’ve explored recently to reduce the redness and appearance of scars. After my tummy tuck, I have this really long scar hidden underneath the bikini line that looks like I’ve had a cesarean section. As I await patiently for it to lighten, I have decided after a year, I would give ClearLift Laser treatment a try. Post written by me for Cosmeticare. All opinions are my own. Registered Nurse, Tannaz Razavi, is a Laser Specialist at Cosmeticare. She handed me some safety glasses and went to work right away. I was laying on my back as she treated my scars with laser. Some areas (like the outer areas by my hips) were more sensitive than others. On a scale of 1-10 with 10 being the most painful, the pain level was about a one or two. In some areas, I didn’t feel anything at all. She also used ClearLift on my reconstructed belly button to remove hyper-pigmentation. I didn’t even know they could treat that area too. Here’s some information about ClearLift Laser below! 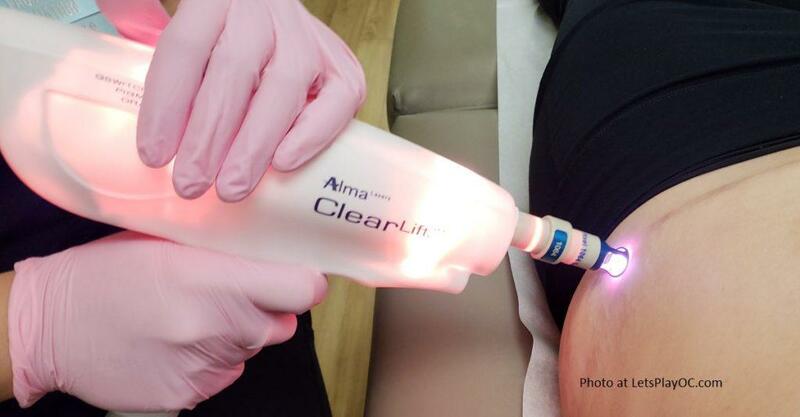 What is the ClearLift Laser? Occasionally referred to as the “Lunchtime Laser,” the ClearLift laser is a non-surgical skin resurfacing treatment with no downtime required. 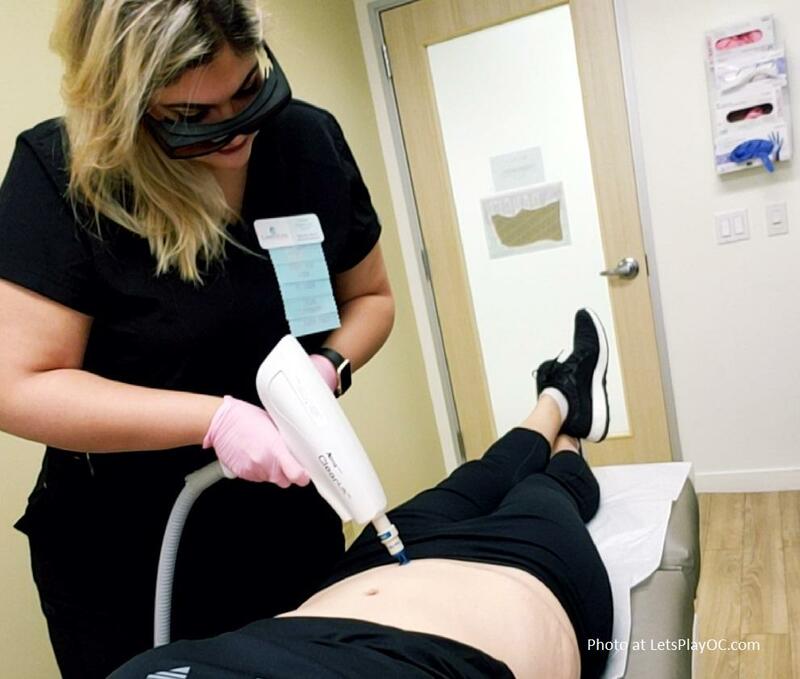 It works from the inside out, allowing the surface of the skin to appear untouched while providing similar results to traditional resurfacing techniques…In spite of the ClearLift laser’s fast and seemingly non-intensive approach, this treatment device offers extreme precision, versatility, and efficacy. It is entirely non-ablative, meaning no actual skin tissue is removed. This allows all of the healing and remedying to occur underneath the visible top layer of your skin, crafting surprising results that seem to ‘magically’ appear. The ClearLift Laser is designed for all skin types, tones, and textures. It is great for anyone with sun damage, wrinkles, acne, blotchiness, or other general problems with pigmentation. When I left, she gave me an after-treatment-care handout. It stated that swelling, itchiness, and flaking may occur and is normal. We shouldn’t rub or scratch the area, but we can apply hydro-cortisone cream as needed. Applying SPF 30+ or sunblock to treated areas is highly recommended. There is no downtime. I’ve had three treatments over the 4 months and I’m sharing my results below! As you can see some of the area turned out better than others. 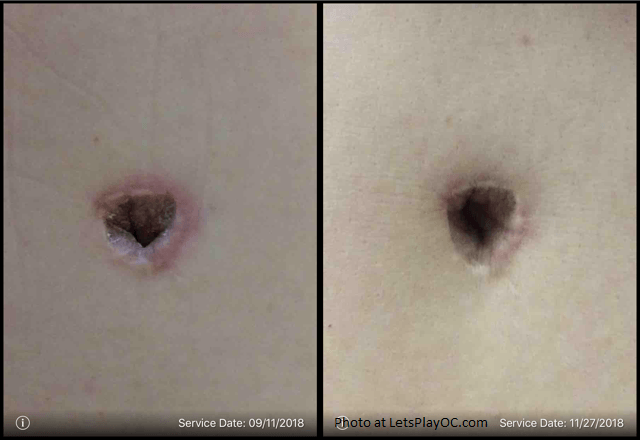 Where the original surgical scar was a dark red, some areas have turned light or white over time. Even though my entire scar is changing unevenly, I am overall very happy that it’s treatable. I know some family members who have keloid-prone skin, this wouldn’t work on them. I will definitely go back for more to get the best results. (You can get up to 6 treatments 4 weeks apart.) Did you notice that it also lightened up my belly button too. I didn’t even know it could do that! For more information, you’ll want to visit their website or schedule a consultation. My readers get 10% OFF when they mention this code: MARY100. Must mention at time when you call, book online or go in the office to receive discount.